From the Departments of Neuropediatrics (G.S., D.S., F.S., S.M.-G., E.G., M.S.) and Neuropediatrics/SPZ (K.v.A. ), NeuroCure Clinical Research Center, Charité-Universitätsmedizin, Berlin, Germany; the Department of Neuropathology (W.S. ), Charité-Universitätsmedizin Berlin, Germany; and the DRK Children's Hospital Berlin (A.v.M. ), Germany. Objective: To identify the underlying genetic cause of a congenital neuropathy in a 5-year-old boy as part of a cohort of 32 patients from 23 families with genetically unresolved neuropathies. Methods: We used autozygosity mapping coupled with next-generation sequencing to investigate a consanguineous family from Lebanon with 1 affected and 2 healthy children. Variants were investigated for segregation in the family by Sanger sequencing. A splice site mutation was further evaluated on the messenger RNA level by quantitative reverse transcription PCR. Subsequently, a larger cohort was specifically screened for receptor expression-enhancing protein 1 (REEP1) gene mutations. Results: We detected a homozygous splice donor mutation in REEP1 (c.303+1-7GTAATAT>AC, p.F62Kfs23*; NM_022912) that cosegregated with the phenotype in the family, leading to complete skipping of exon 4 and a premature stop codon. The phenotype of the patient is similar to spinal muscular atrophy with respiratory distress type 1 (SMARD1) with additional distal arthrogryposis and involvement of the upper motor neuron manifested by pronounced hyperreflexia. Conclusion: To date, only dominant REEP1 mutations have been reported to be associated with a slowly progressive hereditary spastic paraplegia. The findings from our patient expand the phenotypical spectrum and the mode of inheritance of REEP1-associated disorders. Recessive mutations in REEP1 should be considered in the molecular genetic workup of patients with a neuromuscular disorder resembling SMARD1, especially if additional signs of upper motor neuron involvement and distal arthrogryposis are present. Dominant mutations in the gene encoding the receptor expression-enhancing protein 1 (REEP1) are associated with hereditary spastic paraplegia (HSP), designated SPG31.1 REEP1 is associated with the mitochondria1 and the endoplasmic reticulum (ER) and protects neurons from the accumulation of neurotoxic aggregates.2 REEP1 mutations account for approximately 3%–10% of autosomal dominant HSPs; REEP1 is the third most frequent causative gene (following SPAST [spastin] and ATL1 [atlastin 1]).3,4 More than 40 REEP1 mutations have been reported to date, comprising mainly small frameshift mutations that are all transmitted in autosomal dominant fashion.1,3,–,6 Patients with dominant REEP1 mutations have a slowly progressive “pure” HSP that is only rarely accompanied by peripheral neuropathy.3,–,5 Only a single family has been described with isolated distal motor neuropathy.7 We report a patient with a recessive REEP1 mutation with a much more severe phenotype involving severe congenital axonal neuropathy, hyperreflexia, respiratory distress, and distal arthrogryposis, making the clinical phenotype similar to that of patients with spinal muscular atrophy with respiratory distress type 1 (SMARD1). The study was approved by the institutional review board of the Charité (EA1/222/08). Parents provided written informed consent for all aspects of the study according to the Declaration of Helsinki. We performed initial autozygosity mapping followed by whole-exome sequencing (WES) of a consanguineous family with 1 affected patient (figure 1) and 2 healthy siblings. For autozygosity mapping, we investigated the index patient (patient II:03, figure 2A) and 2 healthy siblings (II:01 and II:02) using the Affymetrix 6.0 GeneChip SNP array and performed subsequent analysis using HomozygosityMapper2012 software (http://www.homozygositymapper.org) to identify genomic regions that were homozygous solely in the index patient.8 Subsequent WES was performed on the index patient after capture with the SureSelect V4 kit (Agilent Technologies, Santa Clara, CA) and sequencing on a HiSeq 2000 machine (Illumina, San Diego, CA), yielding 82 Mio 2 × 101 bp paired-end reads that were aligned to the human GRCh37.p11 (hg19/Ensembl 72) genomic sequence. The mean coverage was ×112, and 87.9% of the captured sequences were covered more than ×10. After fine adjustment, the raw alignments were called for deviations from the reference in all coding exons ±20 bp flanking regions. Each of these variants was submitted to MutationTaster2 software9 to search for potentially pathogenic variants. These variants were further filtered for a recessive inheritance model (the variant allele occurs in homozygous state in >20 healthy individuals from the ExAC database release 0.3 [Exome Aggregation Consortium; Cambridge, MA; http://exac.broadinstitute.org] or >10 healthy persons in the 1000 Genomes Project) and a dominant inheritance model (the allele was present in >20 individuals in the 1000 Genomes Project or >100 individuals from ExAC). Segregation of the mutation with the phenotype in the family was verified by PCR and Sanger sequencing using the BigDye protocol (Life Technologies, Carlsbad, CA) on an ABI 3500 genetic analyzer using following the oligonucleotides: forward: 5′-TCC TTC AAA AGG GCA GTG TT-3′; reverse: 5′-CAC CAC TAT TTC TAA ACA CGT CTC A-3′. Fragment length was analyzed with forward: 5′-TGC TGT CTC CCT ACA CAA AAG-3′ and reverse: FAM-GAA AGA ATG AAA GAC ATG-3′ oligonucleotides. (A) Talipes equinovarus foot deformity. (B) Arthrogryposis of the hand, with inability to extend the fingers. (C) High-arched palate as a sign of intrauterine muscle weakness. (D) Diaphragmatic palsy with eventration (white arrowheads). (E) Hematoxylin and eosin staining of the quadriceps muscle rules out grouped fiber atrophy. (F) Staining with anti-myosin heavy chain (fast) antibodies reveals fiber type grouping as a sign of denervation/reinnervation. Type II fibers are depicted in brown. (G) Electron microscopy of the neuromuscular endplate reveals condensation of the axoplasm and degeneration of axonal organelles (open arrowhead), including mitochondria and loss of presynaptic neurofilaments, while the subneural clefts appear normal. Five of 5 endplates that could be discovered in the muscle biopsy specimen had identical abnormalities. (H) Normal neuromuscular endplate of the quadriceps muscle of an age-matched control at the same magnification for comparison. (A) Pedigree of the consanguineous family. (B) Autozygosity mapping of the family. The red bars depict the candidate regions that comprise 132 protein-coding genes. The genetic coordinates refer to the genome build GRCh37.p11 (hg19/Ensembl 72). (C) GeneScan analysis of the insertion/deletion mutation at the intron 4 splice donor site, with homozygosity for the mutation in the patient and heterozygosity in all other family members. (D) Sequence trace of the mutation on genomic DNA. (E) Investigation of receptor expression-enhancing protein 1 (REEP1) on the complementary DNA from cultured fibroblasts verifies skipping of the 121 bp exon 4. No normally spliced transcript was detected in the patient; the mutant bands are faint, possibly because of nonsense-mediated messenger decay. Co = control; mut = mutant band; NTC = nontemplate control; wt = wild-type band. Reverse transcription PCR on the complementary DNA level. Index patient and 2 control fibroblast lines were grown to confluency and trypsinized, and total RNA was isolated using the RNeasy Kit (Qiagen, Venlo, the Netherlands) reagent. A further RNA sample was isolated from a muscle biopsy specimen of the patient. Total RNA was reversely transcribed with SuperScript III Reverse Transcriptase (Invitrogen, Carlsbad, CA) and random hexamers. Oligonucleotide complementary DNA primers flanking exon 4 (forward: 5′-CCT GCG TAT TAT TCC TAC AAG GC-3′; reverse: 5′-CTT GGA AGC AGC CAT CAC AG-3′) were used for PCR, and the resulting products were separated by agarose electrophoresis and subjected to bidirectional automatic Sanger sequencing. The now 5-year-old boy was born at term after a normal pregnancy to healthy first-cousin parents from Lebanon. Two older brothers are healthy. At birth, the patient presented with an equinovarus foot deformity, contractures of the distal phalanges, and a high-arched palate (figure 1, A–C). Later, progressive distally pronounced weakness and hypotonia, mainly of the lower extremities, became evident. Neurography of the sensory portion of the median nerve revealed axonal neuropathy with reduced amplitudes of 2.9 μV (normal 12.0 ± 5.9 μV) but normal nerve conduction velocity of 43.1 m/s (normal > 39.7 m/s). We were unable to elicit any measurable motor response or F-waves after stimulation of the median, peroneal, and tibial nerves. EMG could not be performed because of compliance problems. In contrast, muscle tendon reflexes were very brisk with enlarged trigger zones (albeit without upgoing plantar reflexes), indicating upper motor neuron involvement (video 1 at Neurology.org/ng). Mutation analysis of PMP22, MPZ, GDAP1, EGR2, SH3TC2, IGHMBP2, and TRPV4 genes had yielded normal results. Cranial MRI at 6 months was normal. Muscle histology showed fiber type grouping but no relevant atrophy (figure 1F). Electron microscopy of the axons and endplates (figure 1, G and H) demonstrated loss of presynaptic neurofilaments and a condensed axoplasm with degeneration of organelles in the “bouton terminal.” Respiratory distress and paradoxical breathing due to diaphragmatic palsy were diagnosed at 11 months (figure 1D, video 2). Following recurrent severe respiratory tract infections with acute respiratory failure, noninvasive nocturnal mask ventilation was initiated at 13 months of age. In recent years, the muscle weakness has not progressed; however, he still cannot sit without support. On the other hand, mental and speech development is apparently normal. The healthy parents received a thorough clinical neurologic investigation and displayed normal muscle tone, strength, and reflexes as well as normal sensation, fine motor skills, and gait pattern. The only subtle abnormalities were a high palate and a mild increase in the foot arch of the father. Neurography of motor (median, tibial, peroneal) and sensory (median, sural) nerves in both parents showed normal results. Identification of a REEP1 mutation. Autozygosity mapping revealed several regions on chromosomes 1, 2, 10, 11, and 13 (=27.3 Mbp), comprising 132 protein-coding genes. WES revealed 3 homozygous variants within the autozygous regions that were predicted to be potentially disease causing by MutationTaster2 software. Two of them could be excluded (table e-1). The remaining homozygous splice site mutation in REEP1 at the donor splice site of exon 4 (c.303+1-7GTAATAT>AC, p.F62Kfs23*; NM_022912) was predicted to abrogate the splice site, resulting in a frameshift and premature termination codon after 23 nonoriginal amino acids. This variant was not listed in the ExAC database or the 1,000 Genomes Project as a known polymorphism. Homozygosity of the mutation was confirmed by Sanger sequencing and cosegregated with the phenotype in the family (figure 2C). The splicing defect was verified on the level of the messenger RNA (mRNA) from fibroblasts and muscle (figure 2E). No full-length mRNA transcript was detected in the patient. Repeated Western blots (anti-REEP1, SIGMA SAB2101976, 1:50–1:500) failed to show the presence of the REEP1 protein in extracts from fibroblasts and muscle of the patient and of normal controls, possibly because of low expression levels in these tissues. Finally, we performed molecular genetic testing of REEP1 by sequencing all exons in 3 patients from a cohort of patients with a genetically unresolved SMARD1-like phenotype featuring clinical signs of additional involvement of the upper motor neuron. However, we did not detect any further mutation. In our patient, the functional relevance of the splice site mutation could be demonstrated on the mRNA level in fibroblasts and muscle tissue but not on the protein level, presumably because REEP1 expression levels are too low in these tissues to be detectable by Western blot.1,13 It is interesting that the heterozygous parents are healthy despite their obvious haploinsufficiency. These findings may hint at additional factors in the genetic background of the parents with an influence on REEP1-related pathogenicity, although this remains speculative without having investigated further families with a similar phenotype. Similar to the BSCL2 protein, REEP1 is localized at the ER and is relevant for ER shaping.16 Recently, it was shown in a Drosophila model that overexpression of reep1 prevents tau-mediated neurodegeneration and promotes neuronal resistance to ER stress.2 Thus, REEP1-associated disorders may also be summarized as ER stress diseases, displaying different phenotypes depending on the type of disturbed ER function. However, the precise underlying mechanisms remain to be elucidated. To date, only a few genes are known to be associated with a SMARD-like phenotype. 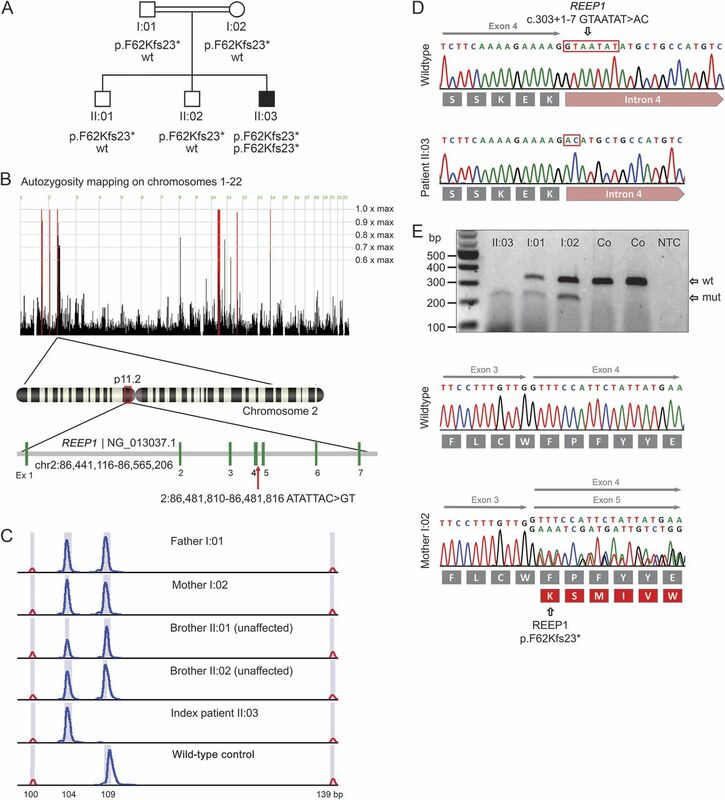 Both IGHMBP2 (SMARD1) and LAS1L (SMARD2 with X-chromosomal inheritance) play a role in RNA processing, protein translation,17 and ribosomal biogenesis.18 In this respect, a function at the ER might hint at a pathogenetic link between IGHMBP2 and REEP1; however, this requires further experimental evidence. In addition, mutations in the riboflavin transporters SLC25A2 and SLC2A3 may also mimic SMARD1, just like mutations in MEGF10, a gene involved in the regulation of satellite cells.19 This reflects the clinical and functional heterogeneity of SMARD-like phenotypes. Our study expands the known phenotypical spectrum of REEP1-associated neuromuscular disorders and highlights that recessive REEP1 mutations should be considered in the genetic workup of patients with a SMARD1-like phenotype, especially if presenting with signs of upper motor neuron involvement. Gudrun Schottmann: recruited, investigated, and phenotyped the patients; performed neurophysiologic investigations; validated the results of the WES; wrote the first draft of the manuscript. Dominik Seelow: developed and applied bioinformatic tools for genetic variant analysis. Franziska Seifert: performed RT-PCR. Susanne Morales-Gonzalez: performed Western blotting. Esther Gill: performed and analyzed the Sanger sequencing. Katja von Au: phenotyped the patient. Arpad von Moers: phenotyped the patient. Werner Stenzel: performed neuropathologic investigations in the muscle tissue. Markus Schuelke: investigated and phenotyped the patients; performed the autozygosity mapping and haplotype analysis; validated the results of the WES; supervised the work and obtained funding support; wrote the first draft of the manuscript. The project was funded by the Deutsche Forschungsgemeinschaft (SFB 665 TP C4) to M.S. and the NeuroCure Center of Excellence (Exc 257) to M.S. Gudrun Schottmann, Dominik Seelow, Franziska Seifert, Susanne Morales-Gonzalez, Esther Gill, Katja von Au, and Arpad von Moers report no disclosures. Werner Stenzel has served on the editorial boards of Neuromuscular Disorders and Neuropathology and Applied Neurobiology. Markus Schuelke has served on the editorial board of Biomedical Research International. Go to Neurology.org/ng for full disclosure forms. Accepted in final form September 8, 2015.
. Mutations in the novel mitochondrial protein REEP1 cause hereditary spastic paraplegia type 31. Am J Hum Genet 2006;79:365–369.
. Functional screening in Drosophila reveals the conserved role of REEP1 in promoting stress resistance and preventing the formation of Tau aggregates. Hum Mol Genet 2014;23:6762–6772.
. New pedigrees and novel mutation expand the phenotype of REEP1-associated hereditary spastic paraplegia (HSP). Neurogenetics 2009;10:105–110.
. Autosomal dominant hereditary spastic paraplegia: novel mutations in the REEP1 gene (SPG31). BMC Med Genet 2008;9:71.
. Exome sequencing identifies a REEP1 mutation involved in distal hereditary motor neuropathy type V. Am J Hum Genet 2012;91:139–145.
. HomozygosityMapper2012—bridging the gap between homozygosity mapping and deep sequencing. Nucleic Acids Res 2012;40:W516–W520.
. MutationTaster2: mutation prediction for the deep-sequencing age. Nat Methods 2014;11:361–362.
. POMK mutation in a family with congenital muscular dystrophy with merosin deficiency, hypomyelination, mild hearing deficit and intellectual disability. J Med Genet 2014;51:275–282.
. Degenerative changes in unmyelinated nerve fibers in late-infantile neuronal ceroidlipofuscinosis. A morphometric study of conjunctival biopsy specimens. Acta Neuropathol 1998;95:175–183.
. A spastic paraplegia mouse model reveals REEP1-dependent ER shaping. J Clin Invest 2013;123:4273–4282.
. REEP1 and REEP2 proteins are preferentially expressed in neuronal and neuronal-like exocytotic tissues. Brain Res 2014;1545:12–22.
. Phenotypes of the N88S Berardinelli-Seip congenital lipodystrophy 2 mutation. Ann Neurol 2005;57:415–424. ; BSCL Working Group. Identification of the gene altered in Berardinelli-Seip congenital lipodystrophy on chromosome 11q13. Nat Genet 2001;28:365–370.
. Hereditary spastic paraplegia proteins REEP1, spastin, and atlastin-1 coordinate microtubule interactions with the tubular ER network. J Clin Invest 2010;120:1097–1110.
. IGHMBP2 is a ribosome-associated helicase inactive in the neuromuscular disorder distal SMA type 1 (DSMA1). Hum Mol Genet 2009;18:1288–1300.
. Congenital lethal motor neuron disease with a novel defect in ribosome biogenesis. Neurology 2014;82:1322–1330.
. Mutations in MEGF10, a regulator of satellite cell myogenesis, cause early onset myopathy, areflexia, respiratory distress and dysphagia (EMARDD). Nat Genet 2011;43:1189–1192.